off the train and treated myself to a hobbit-like second breakfast in Burger King. But you don’t want to hear about that. 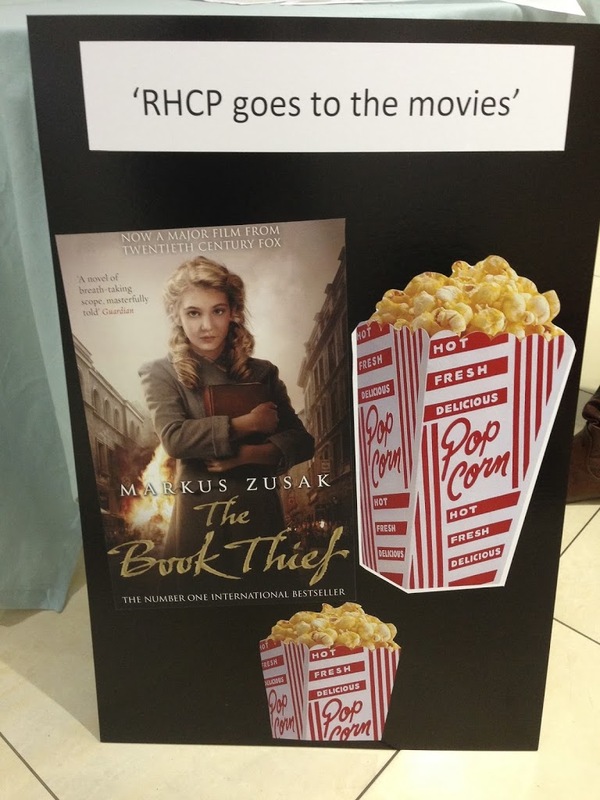 The Book Thief, an emotional roller coaster just from the trailer and I honestly believe everyone in the room was stunned by its impact. I have this on my shelves but am yet to read it, I was planning on doing so before watching the movie anyway but that trailer has made me want to read it like yesterday so it is on my pile of ‘read soon’ books. The Seventh Son, based on the Joseph Delaney books which I have read a few of and loved. This was meant to come out at the end of last year but unfortunately was delayed until February 2015, sad to know I wont see Kit Harington on the big screen until then, unless I watch Pompeii of course! So basically, I could definitely see why RH wanted to invite us to the movies. They must be so proud that so many of their books are being brought to life on the big screen and I am definitely looking forward to seeing the adaptations. I think Trash will be brilliant if its done right and I am intrigued to see if the characters from Fallen will look anything like they do in my head! Next up was a chat about the upcoming books for the first six months of 2014. There are some absolutely incredible books coming out and to be honest there are too many to mention in one blog post so I am going to have to skim over some. Bird by Crystal Chan is one I am skimming over but only because I read it and it was incredible and my review for it will be posted next week. I got especially excited for two books on the presentation as they sound just incredible. Heart Break Girl by Malorie Blackman in a prequel to Boys Don’t Cry and follows Mel, the mother of Dante’s baby, in the run up to the events of BDC. I am very, very excited for this as Malorie Blackman is one of my favourite authors EVER and I need more of this story to keep me going. Heart Break Girl will be published in May. Arriving slightly earlier will be The Forbidden Library by Django Wexler in April. This sounds amazing, very much my cup of tea as a 9-12 fantasy story and to make it even better in involves forbidden libraries and magic. Random House have kinda suggested it will be an adventure story that is totally unique, but if you are going to compare it to anything you want to look towards Naria, Alice in Wonderland and Inkheart. The more I hear about this book the more I need it in my life and I will do anything to get it. I may be stood outside of my local bookshop waiting for it to open on April 10th! The Fearless, the second book from 2013 debut author Emma Pass, was given a shout out and sounds just as incredible as ACID was. The story centres around a girl and her brother, who are trying to survive against terrifying enemies called the fearless. They are everyday people, but stripped of all humanity, empathy and love. It sounds scary and amazing all at the same time and I love that the enemies make a home out of Meadowhall Shopping Centre! Genius Idea, and you will be able to have a read on April 24th when The Fearless hits the shelves. Another scary but amazing sounding book is Web of Darkness by Bali Rai, this focusses in on the terrifying side of the internet when it comes to talking to strangers. A serious ‘Stranger Danger’ shoutout apparently, but with Bali Rai’s talents its bound to be a brilliant one. My intrigue shot up when The Boy in The Tower by Plly Ho-Yen was described as The Day of the Triffids meets Wonder as I really can’t picture what that even means… but I’m definitely going to try and find out. The Boy is Ade and he and his mum live in a tower block in south London, that is until the buildings start to crumble and strange plants come out from the ground and Ade is trapped in his tower with his mum and they can’t get out…. frightening and amazing sounding all at once, we shall find out which it is more on July 3rd when its published. The sequel to The Oathbreaker’s Shadow by Amy McCulloch, on its way in July, is called The Shadow’s Curse! The event was concluded by a reading from Matt Haig of his new book, Echo Boy, which I am intrigued about greatly. Matt introduced his characters, told us a bit about how the idea came about and then read a chapter from each of the two perspectives in the book – which made me was to read it all the more as I love split perspectives! There was a Q&A session with Matt in which he told us that his favourite YA book was most definitely The Outsiders, which was YA before YA was even a thing, and that he used to work in Oddbins round the corner from the Random House offices and spent time whenever he had to delivered them wine or champagne for author parties hoping that one day it would be him! All in all RH did well, as they always do, and put on a great morning. I got to catch up with some brilliant blogging friends and the lovely publishers and even got treated by a goodie bag with some upcoming books in! Yay! Thank you so much for the event Random House! !